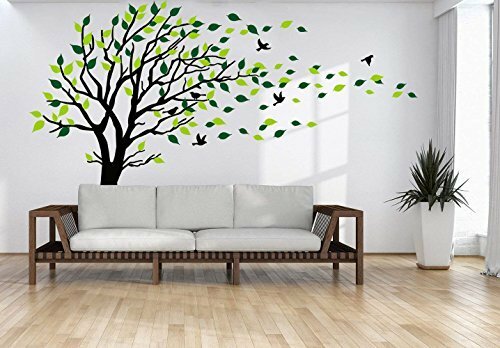 • A newly painted surface is not recommend to use wall sticker until it is complete dry after 8 weeks. • The images on the picture is for illustration purpose only, please refer to the actual size sheet. • The actual color may vary slightly due to individual monitor setting. 1. FLATTEN IT FIRST，VERY VERY IMPORTANT. (IT IS BETTER TO TAKE 2 OR 3 DAYS). Wipe your wall, make sure it is dust free, oil free, smooth and dry before you apply it onto it. 2. Cut the sticker into smaller units/Parts if necessary, just for easily apply the smaller unit/part to the wall. Always plan before you apply it on the wall. 4. Use Credit card (or other card) to scrape over the applied sticker only to remove any bubbles. 5. The best way to apply it is that two people work together. Removable and waterproof.Enviromental PVC wall decal without leaving damage or residue. Diy art mural makes interesting and enjoyful.You can apply them by the way you like. If you have any questions about this product by MAFENT, contact us by completing and submitting the form below. If you are looking for a specif part number, please include it with your message.